We can fit any size, type or style of kitchen you require in the Blackpool and Lancashire area, including Bispham, Cleveleys, Fleetwood, Lytham and St Annes. We can advise on the best materials to use, such as suitable woods or finishes, ensuring your home has a beautiful new kitchen you can be proud of. 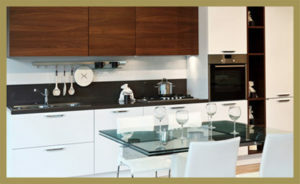 We also work with private landlords and small commercial property owners wanting an affordable kitchen fitting service. If you need help with having a kitchen fitted, just contact us on 01253 625 015 for a quote. Why Have A Kitchen Fitted? Going to a large-chain kitchen supplier to purchase your kitchen and using their in-house fitting service can work out expensive, sometimes running into thousands of pounds. But often, when you hire an experienced kitchen fitter you can shave hundreds off those extra costs. You can be assured of an expert finish, delivered by experienced and knowledgable tradesmen/woman. Why Use TM Maintenance’s Kitchen Fitting Service? We have over twenty years experience in fitting kitchens. Before you make your decision to buy, we can advise on exactly what you’ll need, what will work and what won’t. We are always honest and upfront with our prices, providing accurate quotes before we start any job. We have fitted hundreds of kitchens over the years. We are able to fully fit a new kitchen or make smaller repairs if required, such as repairing doors or replacing worktops. No job is too big or too small. If you’re interested in having your kitchen fitted, just fill in the contact form on our contact page here. "Thanks to everyone at Kendal Upholstery for such a great introduction to the world of upholstery.